Description of Taleb's Black Swans. Explanation. Black swans were presumed not to exist since the days of Juvenal and Aristotle. Actually, the term was always used as a statement of impossibility. However in 1697, Dutch explorer Willem de Vlamingh made the first European record of sighting a black swan in 1697 when he sailed into, and named, the Swan River on the western coast of New Holland, the later Australia. According to Nassim Nicolas Taleb, a Black Swan Event is a low-probability, high-impact event that is impossible to forecast or predict. In his 2007 book The Black Swan: The Impact of the Highly Improbable he says we currently live in a world of opacity, where knowledge is overestimated and chance and uncertainty are underestimated. We don't know what we don't know! 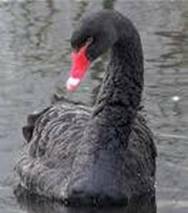 Banks and trading firms are seen as very vulnerable to hazardous Black Swan events and are exposed to losses beyond those that are predicted by their defective financial models. The main idea in Taleb's book is not to attempt to predict Black Swan Events, but to build robustness to negative ones that occur (compare Organizational Absorption), and being able to exploit positive ones (anti-fragility), for example by making a profit out of it (compare Strategic Agility). Taleb is developing a new decision-making theory. This theory aims to reduce the impact of threats we don't understand, instead of perpetuating the illusion of control that we can anticipate the future (as is typically done in credit and operational risk management). According to Taleb, we have to worry particularly about the fourth quadrant, which is dealing with complex, expectation-based decisions in the domain of wild randomness (with heavy and/or unknown tails, having no or unknown characteristic scale). Using statistics in this quadrant is extremely dangerous (See also Plausibility Theory). The decision theory of Anti-fragility tries to return from this fourth quadrant to the second or third quadrant. In the other quadrants (1, 2 and 3) you can use statistics quite safely. After its first recording, the event is rationalized by hindsight, as if it could have been expected (e.g., the relevant data were available but not accounted for). 'Black Swans' are often misunderstood and even ignored by humans. This is partly caused by cognitive biases, in particular: hindsight bias, bandwagon effect and narrative fallacy, confirmation bias and silent evidence, status quo bias, illusion of control bias and ludic fallacy, and overconfidence bias. A problem of induction is that "No amount of observations of white swans can allow the inference that all swans are white, but the observation of a single Black Swan is sufficient to refute that conclusion." (David Hume, 1711-1776, Scottish philosopher and economist). They try to anticipate extreme events. They study the past for guidance. They disregard advice about what not to do. They use standard deviations to measure risk. They fail to recognize that mathematical equivalents can be psychologically different. They believe there's no room for redundancy when it comes to efficiency. According to Taleb (Business Week 2008, #7), banks have a tendency to sit on time bombs while convincing themselves that they are conservative and nonvolatile. Furthermore Taleb blames the science of risk management for causing this behavior, and business schools and the financial economics establishment for having a vested interest in promoting risk management models and devaluing common sense. 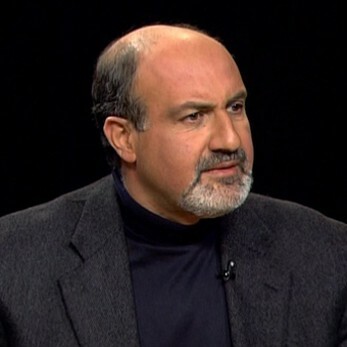 Nassim Nicholas Taleb was born in Lebanon in 1960 and received his bachelor and master in science degrees from the University of Paris. He holds an MBA from the Wharton School at the University of Pennsylvania and a PhD in Management Science from the University of Paris. His thesis was on the mathematics of derivatives pricing. He is a former trader for various financial firms on Wall Street and was a professor at several universities. Obsessed by chance, randomness and uncertainty, in 2004 Taleb publishes the first print of his book Fooled by Randomness: The Hidden Role of Chance in Life and in the Markets in which he sees an overestimation of skills and an underestimation of luck. He criticizes risk management methods used by the finance industry and warns for upcoming financial crises. Indeed in 2008-2010 the financial (banking) crisis occurs, based on too much debt, agency problems (bonus without malus), complexity and leverage. Increased awareness of uncertainty in decision making. Insight in the veins of the causes of the 2008 crises. New way to deal with risks and uncertainty. Taleb is a maverick and Black Swan Thinking is rather extreme. Theory is not yet mainstream. A decision theory based on anti-fragility is still work in progress. Black Swans cannot be predicted because they are rare. Overestimation of knowledge; underestimation of randomness and uncertainty. 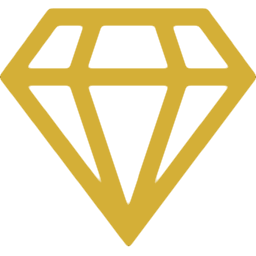 Overestimation of skills; underestimation of luck in life. This ends our The Black Swan summary and forum.